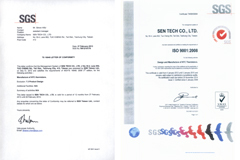 SEN TECH was established in 1994 and is a professional manufacturer for sensor devices. SEN TECH has strong background and human resources in research and development. Hence, all of our sensors are produced from raw material to completed unit. As SenTech has devoted to sensor field for more than ten years, we has accumulated abundant technology and experience, especially in NTC thermistors. Hence, we are welcome and capable to cope with your customized requirement. VISION - To be a leading multi-national world class supplier in the field of sensors and optoelectronics. MISSION - To achieve the highest level of customer satisfaction in quality, services and cost. SEN TECH CO., LTD was established as a professional manufacturer of photoconductive cell CdS with technical support from US company. Developed transient voltage suppression devices (Varistor) with Industrial Technology Research Institute. Accomplished the development of negative temperature coefficient thermistors by our own R&D crews and mass production was started. The first branch factory in Guang Dong Province of China was set up to provide better and faster service for customers in mainland China. Our NTC thermistors were successful to be applied for Medical field. ISO 9001 / 2000 acquired in December. Our NTC thermistors were successful to be applied for Battery Pack field in domestic market. Our NTC thermistors were successful to be applied for Home Appliances field in oversea market. Our NTC thermistors were successful to be applied to HVAC field in oversea market. Expanding the production Capacity of NTC Thermistor. Our NTC thermistors were successful to be applied for Battery Pack field in oversea market and WLAN field in domestic market. UL1434 for some series acquired on February. File no. E301159. The automation group was set up to design and assemble our own auto production line for NTC thermistors. Our NTC thermistors were successful to be applied at EV (Electrical Vehicle) field in oversea market. ISO/TS 16949:2009 3rd edition. Letter of Conformance. Established another branch factory in Philippines. To start running the NTC thermistors production lines in Philippines branch factory. IATF 16949:2016 acquired in May. Values mentioned in the catalog are reference purpose only. please request specifications for the part, which you plan to use.